Have you been watching Netflix’s latest hit show, Tidying Up With Marie Kondo? Kondo’s book, The Life-Changing Magic of Tidying, was a best-seller back in 2014, and since the series was released at the beginning of the year, it’s been discussed endlessly in newspapers and on social media. Start your kitchen sort-out by thinking about what you use most, and what gets left in a cupboard to gather dust. You might have kitchen gadgets that you simply don’t get the use out of – so take the opportunity to get rid of them. Give them to a charity shop, pass them on to a friend or neighbour, or see if your local area has a selling page on Facebook. And while you’re finding a new home for that bread maker/juicer/spiraliser, have a look at your crockery and get rid of anything that’s chipped or has seen better days. Another thing to sort is your Tupperware – any lids without boxes or boxes without lids? Get rid. It sounds obvious, but use your worktop space wisely. Keep the things you use most often out on the counter-tops, and put everything else in drawers or cupboards. Place teabags and coffee by the kettle, with mugs in the nearest cupboard, and oil, salt, pepper, and your most-used utensils next to the hob. Magnetic knife holders and wall-mounted racks for things like small pans, sieves and colanders are handy for keeping your most useful items within reach without taking up vital worktop space. Be savvy with what you put where. If you’re storing things like casserole dishes and other heavy pots and pans on high shelves, make your life easier and move them down to your floor units. 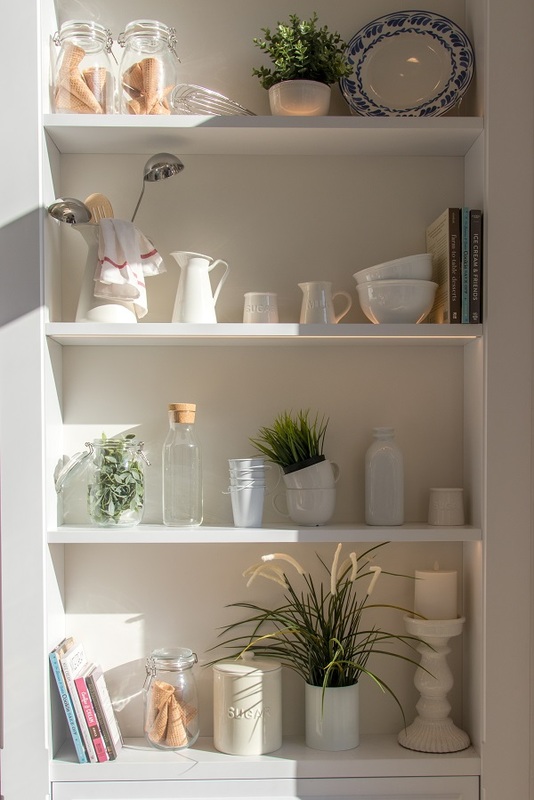 And while you’re sorting your cupboards, look at your shelf spacing – if you’ve got big gaps, move shelves up or down so you can fit more in, and hopefully remove clutter from your worktops. 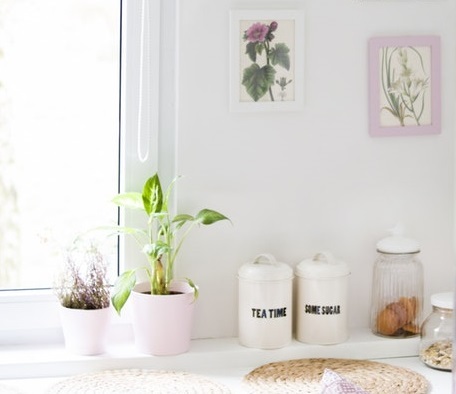 Kilner jars and pretty baskets can make your kitchen Pinterest-worthy, but if they take up more space than they save you, then it’s time to be practical. Jars often take up more space than the boxes or packets they’re replacing, so don’t feel you have to decant ingredients in order to have an organised kitchen. Big Kilner jars make great vases, so you don’t have to get rid of them completely. Because we spend so much time in the kitchen, it can easily become a place where stuff just gets dumped – keys, paperwork, magazines and newspapers, bits of stationery, and so on. Be strict! If it’s not kitchen-related, it needs a new home. The most important thing to remember when you’re decluttering is that everything should have its own place. If your worktops become a place where the post piles up or car keys and loose change get left, hang a few hooks by your front door for keys, get a folder or box file for your post, and have a money box for your coins. Need an incentive to keep your kitchen ship-shape and free of mess? Give the room a make-over – replacing your cabinet doors will instantly refresh the space, and is far quicker and cheaper than doing a complete refit. White doors are great for boosting the sense of light and space in your kitchen, while gloss-finish doors are crisp, contemporary and highly practical, as they wipe clean easily. Need to tweak your units and drawers to fit more in? We offer drawer-boxes, easy-to-assemble cabinets, and a range of storage accessories.